Note: This blog post refers to release 1.1 of SAP Fraud Management. As of release 1.2 SP08, SAP Fraud Management was renamed to SAP Business Integrity Screening. For more information on SAP Fraud Management or SAP Business Integrity Screening, please refer to http://www.help.sap.com/fra or http://www.help.sap.com/bis. SAP Fraud Management uses a modular architecture so that partners and customers can extend the solution with new detection rules and investigation features. You can quickly adapt SAP Fraud Management to address new customer-specific fraud scenarios. 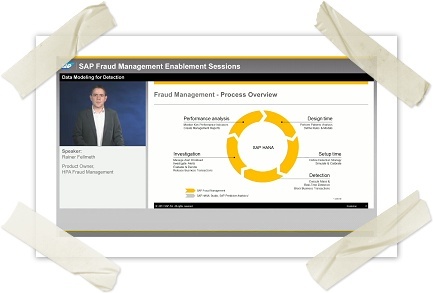 The following videos in the series SAP Fraud Management Enablement Sessions are on offer (it takes a couple of seconds to start the video player – don’t be alarmed if you have to wait a short while). The Enablement Sessions build on one another. View the entire series if you are newbie to SAP Fraud Management, or skip to the video that helps you with your current task. If you want to open the video in a separate browser window or tab, you can do this by using the context menu. You can also turn to the Extensibility Guide for SAP Fraud Management for support in your enhancement projects. 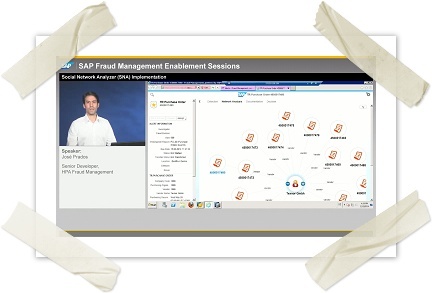 Here, you’ll get an overview of the Enablement Sessions and a quick introducton to SAP Fraud Management. This session explains how detection is modeled in SAP Fraud Management, how to create your own detection data model, and how to set up the data model in Customizing. Here, you’ll learn how to implement a detection method in SAP Fraud Management. The solution uses detection methods to find specific irregularities, using SQLscript procedures to harness the speed and power of SAP HANA. A detection strategy groups related detection methods to search for signatures of business irregularities and potential fraud. This video explains how to set up and optimize detection strategies using SAP Fraud Management Calibration. 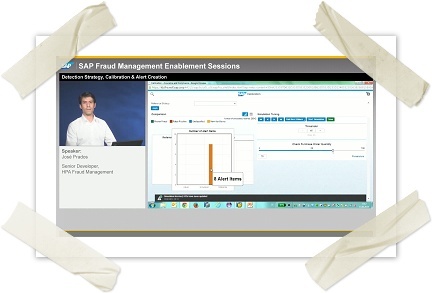 You’ll also learn about alerts in SAP Fraud Management. In this video, you’ll learn how to set up the Network Analyzer provided by SAP Fraud Management to analyze your own detection data model. The Network Analyzer is a powerful investigation tool for graphically displaying relationships in the data, such as relationships between suspicious purchase orders and potentially fraudulent vendors.